Specialty coffee has certainly enjoyed a rise in Brisbane over the past three or four years. Although a number of cafés and/or roasters have emerged in suburban areas, for workers in and around the CBD there has never been a better time to sample some of Brisbane’s finest coffee. If you are inclined to agree, though are perhaps wondering where to start or visit next, Glenn and George at Bean Brewding have things well and truly covered. 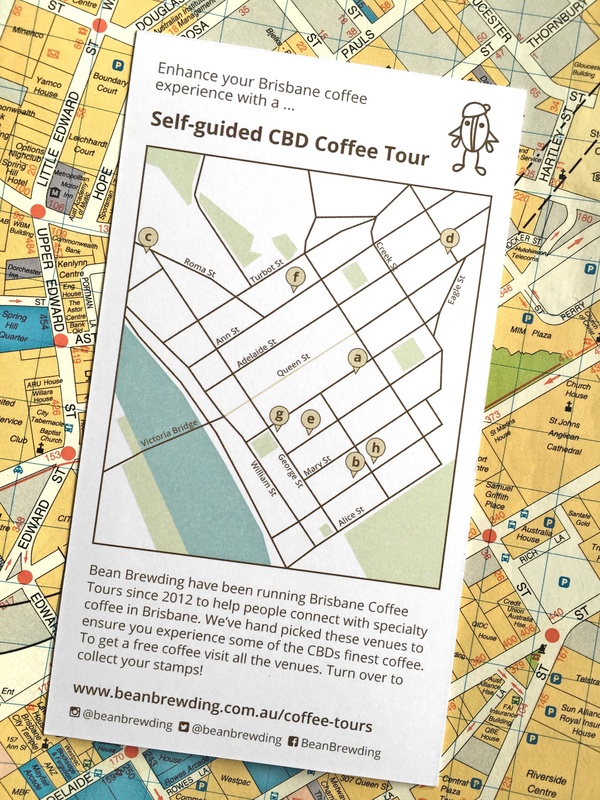 The team behind Brisbane’s first and only coffee tours (running since 2012) have devised a handy Self-guided CBD Coffee Tour, mapping your path to some of the better coffee stops across the city of Brisbane. You can find out more about regular coffee tours of various regions in and around Brisbane, as well as other one-off events on the Bean Brewding Coffee Tour Page, and having attended several, I can highly recommend them. The tour is a stroke of genius, and reminiscent of the “disloyalty” card which sprang up in London (or so I believe) a few years ago. Regardless of the name, the idea is to guide the budding sipper to establishments where great coffee is served, however might be outside the usual well-travelled radius from your office. Of course I should also acknowledge working in the Brisbane CBD is not a pre-requisite to enjoying the great coffee it has to offer either. 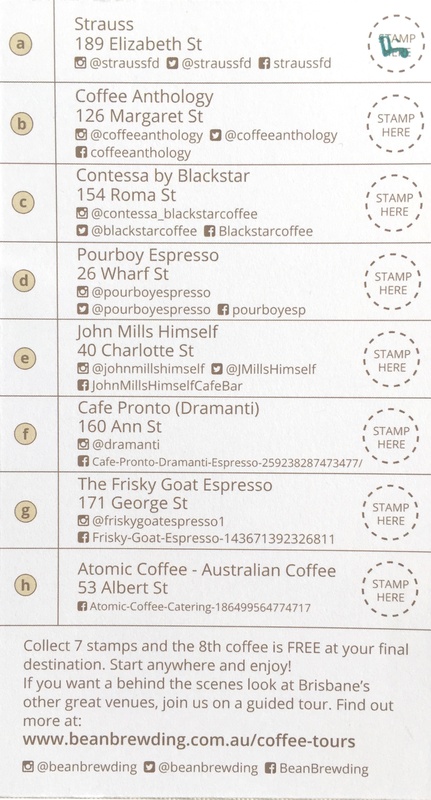 Listing eight cafés from Margaret St all the way across to Roma St and many in between, the tour operates in a similar way to the well-known loyalty card concept — in which your final stop (in this case the eighth coffee) is free. I’d argue however, the benefits of embarking on this journey far outweigh simply saving a few dollars. In one sense, yes, it is a geographical journey around Brisbane’s CBD – however it is also a journey through different styles of coffee, roasters, brew methods, and cafe environments. It’s a way to experience something different, yet of a quality endorsed by some of Brisbane’s most experienced coffee drinkers. It’s choosing to step off that well-worn path from the office to your “local” and back. For me, it is also the unexplored adventure of visiting somewhere a little different, in perhaps an unfamiliar environment — and revelling in the experience for a short while before that inevitable return to those elevator doors back at the office. If you think that’s overstating things a little, perhaps you don’t see your coffee and lunch breaks the same way I do. Fair enough — though either way, I believe you’ll enjoy this tour. As they say, every journey begins with a single stamp (or something like that anyway), and I’m away. Of course as you can see, the one I have collected so far is at the end of that well-worn path I’ve referred to above, however I’ll get there. You see for me personally, my cafe life is a hopeless combination of familiarity and loyalty (the merits of which I am happy to vigorously defend), so I plan on using this card to do exactly what I’ve suggested above — sample the delights this city has to offer, and with the weather that little bit cooler, there has never been a better time to charge around the city. So, whether you plan on working from top to bottom, or perhaps random number generating your way around — pick up a card from any of the participating cafe’s and get started. I’ll see you on the trail, or perhaps at the brew bar, and do check in with the hashtag brisbanecoffeetour — I’m sure the guys would enjoy hearing of your journey. Whichever way you go, might I suggest the idea is probably not to get through the entire list in one day.